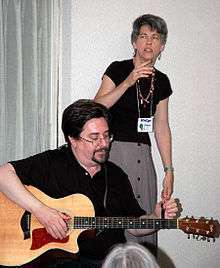 Patrick Nielsen Hayden and Emma Bull, making music at Wiscon, 2006. Filk music is a musical culture, genre, and community tied to science fiction/fantasy fandom and a type of fan labor. The genre has been active since the early 1950s, and played primarily since the mid-1970s. as a noun, referring either to the genre (thus equivalent to "filk music") or to a filk song. "A filk of ___" refers to a filksong based on another song, using the same tune and often, but not necessarily, similar structure in the lyrics. Full appreciation of a parody requires familiarity with the original, but appreciation of a reuse does not. Of course, there are grey areas. To participate in a filk song circle, as in, "We were filking last night until three in the morning." To write a filk music parody of an existing song, humorous or otherwise, as in "I filked 'Hope Eyrie'." When used in this way, "filk" does not imply that all song parodies are considered filk music, nor does it imply that all filk songs are parodies. Setting satirical or parody lyrics to established tunes is not exclusively the province of science fiction fandom. Works of parody music such as those found in MAD Magazine or performed by Weird Al Yankovic have their own long-established traditions and history. As Interfilk's What is it? page demonstrates, there is no consensus on the definition of filk. Attempts have been made to define filk based on various criteria. Filk circles can be formalized parts of larger events, such as being assigned a specific time and location on the schedule of a science fiction convention, or they can be completely informal and spontaneous, forming organically in hotel hallways and lobbies. Filk-specific conventions will usually have multiple filk circles happening simultaneously in different rooms, with some circles focused on a single style or topic. Local parties called housefilks are day-long events organized around a single filk circle held in the host's home. 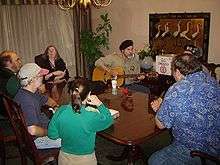 A formally organized filk circle can have the chairs set up ahead of time, with the organizers estimating the number of participants and adjusting the size of the circle as best they can. A circle that is too large for the number of participants tends to feel uncomfortably empty, but a circle that is too small must enlarge as the number of participants grows. The disruption that results from attempting to enlarge a filk circle in progress can break up the flow of the songs and change the mood, so enlarging the circle is often avoided in favor of adding extra layers (concentric circles) outside the inner circle (space permitting). In a bardic circle, each person in the circle (as well as those sitting in concentric circles around the inner circle, if any), go in turns, with each turn moving sequentially either clockwise or counterclockwise around the circle. Each participant is given the choice of pick, pass, or play. "Pick" means they can request a specific song, a specific performer, a general topic or style, or any other similar request from an individual or from the circle in general. "Pass" means they skip their turn and the choice passes on to the next person in sequence. "Play" means they can perform any song they choose, either specific to the current topic or mood, or deliberately different from the current topic or mood. The chaos circle's advantage is its spontaneity and energy. "Runs" of songs will frequently get started, with each new song intended to make some sort of connection to or commentary on the prior song's topic. The disadvantage is that it takes concentration and effort be polite and respectful in a chaos circle: It's easy to accidentally interrupt another performer who's trying to start up a song of their own, especially in a very large circle where one might not be able to easily hear the other performer on the opposite side of the room. Chaos circles thus have a reputation of favoring bold, loud performers who can command attention. Anyone may make a nomination. A nomination consists of a description of what the nominee has contributed to filk music and the filk community. Nominations are reviewed annually by a jury consisting of the convention committee of FilKONtario (with the exception of David Hayman, who serves as administrator) and a representative from the committees of each of that year's other filk conventions. The jury members vote independently by secret ballot, and thereby select that year's inductees. Typically, three people are inducted each year, at the banquet at FilKONtario. A small editorial committee combines and edits the text of the nomination(s) to produce a citation, which is read aloud at the banquet presented to the inductee along with a plaque, and posted on the Hall of Fame web site. ↑ Coppa, Francesca (2006). "A Brief History of Media Fandom". In Hellekson, Karen; Busse, Kristina. Fan Fiction and Fan Communities in the Age of the Internet. Jefferson, North Carolina: McFarland & Company. pp. 41–59. ISBN 978-0-7864-2640-9. ↑ Filk Music: What is it?. Last revised: September 23, 2013. Accessed Sept. 16, 2016. ↑ "Filk Hall of Fame: This Is My Tribe". ↑ Jardin, Xeni (1 September 2005). "Filk Music for Nerd People". Wired. 1 2 3 4 Bragg, Roy (18 July 2010). "Filk: Sci-fi meets folk music". San Antonio Express-News. Retrieved 20 July 2010. ↑ Rogow, Roberta (1991). Futurespeak: A Fan's Guide to the Language of Science Fiction. New York: Paragon House. p. 238. ISBN 978-1557783479. ↑ Gold, Lee. "Tracking Down The First Deliberate Use Of "Filk Song"". Retrieved 2006-11-25. ↑ John Hall. "Filk Music and the Dorsai Irregulars". Retrieved 2006-11-25. ↑ "ConChord History Pages". Retrieved 23 September 2016. ↑ "The Northeast Filk Convention". ↑ Sutton, Brenda (2011). "Guest of Honor : Dr. Mary Crowell". Conflikt: A Pacific NorthWest Filk Convention. Retrieved 18 November 2014. We watched this beautiful young woman lug her keyboard (not the most portable of filk instruments, mind you) into the filk room with a slight amount of dread and a large measure of anticipation. And then she played her opening measures -- all Gershwiny, bluesy, and fine -- we all relaxed. 1 2 Gold, Lee (2004). "Welcome to the Filk Circle" (PDF). MASSFILC: The Filk Music Club of New England. Retrieved 18 November 2014. 1 2 Nye, David E. (1994). American Technological Sublime. Cambridge, Massachusetts: MIT Press. ISBN 0-262-64034-1. OCLC 36213568. 1 2 Jenkins, Henry (1992). "'Strangers No More We Sing': Filk Music, Folk Culture, and the Fan Community". Textual Poachers: Television Fans and Participatory Culture. New York: Routledge. ISBN 0-415-90571-0. OCLC 26055104. ↑ Childs-Helton, Barry; Sally Childs-Helton (2003-03-29). "Acceptance Speeches of Barry & Sally Childs-Helton". Filk Hall of Fame. Archived from the original on 2007-10-23. Retrieved 2007-11-29. ↑ "Filk Hall of Fame". ↑ Judith Hayman; Dave Hayman (March 2001). "The Filk Hall of Fame: A Short History". Filk Hall of Fame. Retrieved 18 November 2014. ↑ "Filk Hall of Fame: Nomination Information". Boros, Chris (9 January 2010). "Science-Fiction Music: Monsters, Aliens In 'Filk'". All Things Considered. Retrieved 10 January 2010. Cohen, Georgiana (20 March 2008). "What is Filk?". The Boston Phoenix. Retrieved 27 August 2008. List of upcoming Filk-Conventions, available as .ICS/iCalendar, too.